Our web site takes its name from the small business we operated between the years of 1988-1994. 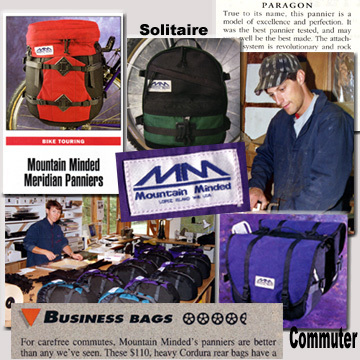 Using the label “Mountain Minded,” we manufactured a line of “Expedition Quality Bicycle Panniers.” Although we were never a big company, we’ve enjoyed a lasting reputation for our innovative designs and careful attention to detail. It began with a 9-month, 7000-mile mountain bike tour we made from Seattle to La Paz, Bolivia. Having sewn much of the equipment for our trip we returned with numerous ideas for improvement. With the simple mission of building the best possible bicycle panniers we bought our first industrial sewing machine and set to work on our designs. Over the next few years we clocked long hours in our Lopez Island studio as our product line grew—just the two of us building each pair of panniers by hand. In 1993 our efforts gained national attention when Bicycling, Outside, Backpacker and Adventure Cyclist magazines published glowing reviews. Our business boomed as we took orders from all over the states, Puerto Rico, Canada, Germany and Japan. But growth also brought some difficult decisions. Having reached the limit of what the two of us could produce alone we were still struggling to earn a living from our work. Faced with the difficult choice of cheapening our designs, producing our goods offshore or hiring low-wage employees our business stalled. In the end it was decided that none of those choices felt right so in the fall of 1994 we filled the last of the backorders and quietly closed the door to our shop. It had been an occasionally exhilarating, often tedious education in small business ownership but we moved on feeling proud of what we had accomplished together. Although it has been more than 20-years since the last Mountain Minded pannier was sewn we still receive emails from cyclists using our products. If you have a story to share about your experience with Mountain Minded equipment—contact us, we’d enjoy hearing from you too. If you’ve arrived at our site hoping to purchase our panniers—sorry, they’re long gone! In the Mountain Minded spirit of human-powered adventure we’ll keep exploring wild places and you can be sure we’ll be watching for our label. Hope to see you out there!